« Who was Jack Kerouac? Growing up in Lowell, Mass., Jack Kerouac’s family spoke French in the home and young ‘Ti Jean (little John) didn’t speak English until he was 6 years old and learned it in school. He admirably avoided “franglais” in his writing and journals, generally using one or the other, and that quite well. This racing sheet is an example of the imaginative projects he was doing by about age 14. 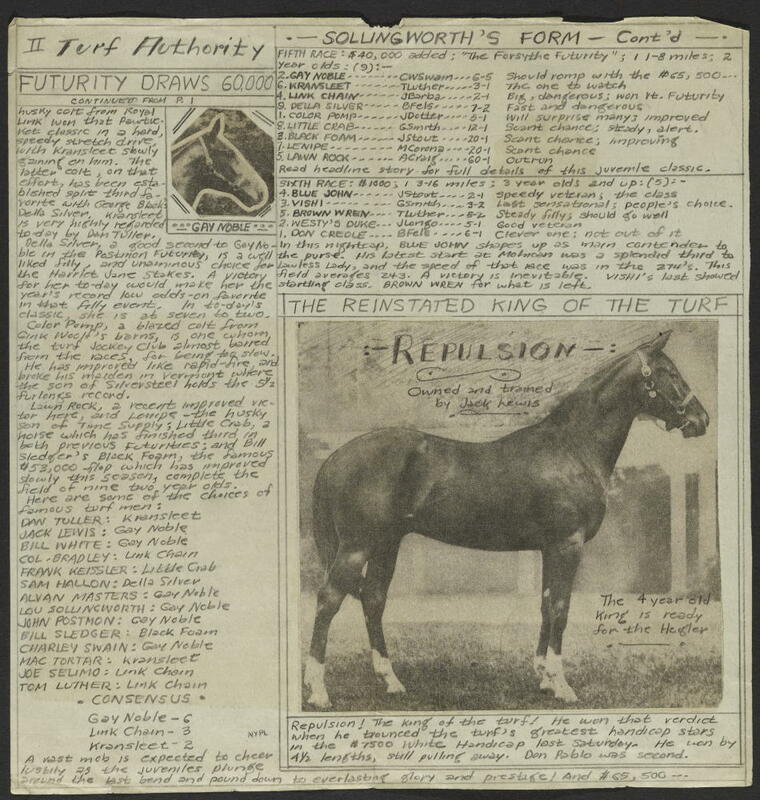 His father was a printer and Jack imitated press work by creating his own broadsheets, this one devoted to race horses. It foreshadows his immensely imaginative fantasy baseball game, which he created and played, with nine full clubs, their own stats and a World Series. It’s humbling to spend time reading the careful articles and cohesive mind that created this prize steed, “Repulsion,” named so for his ability to ward off competitors. ABOVE: Jack Kerouac. “Turf Authority.” Manuscript in newspaper format, January 5, 1937. New York Public Library, Berg Collection, Jack Kerouac Archive. Reproduced courtesy of John G. Sampas, legal representative of the estates of Jack and Stella Kerouac. This entry was posted on February 26, 2008 at 10:14 am and is filed under Uncategorized. You can follow any responses to this entry through the RSS 2.0 feed. You can leave a response, or trackback from your own site.